Mumbai is people. If you don't like people you will misunderstand, even underestimate, Mumbai. It is impossible to understand Mumbai only through its economy, geography or demography. The 10 terrorists who attacked Mumbai on November 26 last year succeeded in killing unarmed Mumbaikars, but failed totally in their mentor's larger goal of crushing the soul of Mumbai, because Mumbai is not about the Taj, the Trident or the Chhatrapatti Shivaji Terminus. Mumbai is great because every slum-dweller dreams of enjoying the Taj's luxury one day when he makes enough money in the City of Gold. The definition of a Mumbaikar is simple. If you have imbibed the spirit of Mumbai, you don't easily surrender, bow down, nor are you broken or have your spirit diminished. 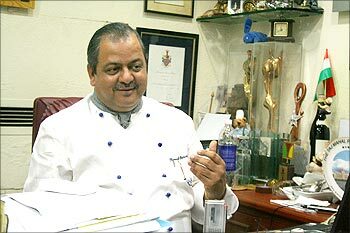 Hemant Oberoi, the Taj's 55-year-old corporate chef who, along with his team, kept his kitchen running to serve traumatised guests amid gunshots and grenade explosions that dreadful November day, symbolises Mumbai's never-say-die spirit. rediff.com's Sheela Bhatt met Hemant Oberoi to get him to look back on that traumatic night, to know about the healing process, and to recount the lessons learnt from the tragedy. Oberoi has occupied the same cabin inside the Taj's famous kitchen for 24 years. This is his adda (sanctuary) adorned with more than two dozen Ganeshas. On that horrendous night the terrorists barged in barely six feet from his cabin to spew death and destruction. He begins the conversation by saying, "I very much remember my colleagues who lost their lives. Seven of my chefs died, and three were injured badly." Pointing to the passage outside his cabin he says, "When terrorists entered the hotel I was right here. As soon as we understood the situation our thought was to take care of the guests. We were stuck here the entire night." It is difficult to imagine how he could keep his kitchen going even as frenzied terrorists went about their murderous spree just a few yards away. He describes his cool thus: "You see, if I get panicky my whole team will get panicky. Our guests were already in a state of great panic." What about the fear of death from a terrorist's bullet? Pausing to think, he says, "I don't think... I mean, till one point we didn't fear and kept working, but not anymore. We have seen death from very close. I don't have fear. On that night we were not sure whether we will be alive the next morning." "We didn't think about ourselves because there were 300-odd guests inside the Taj. The food and beverages team had 100-odd people working right here. I think they performed their duty phenomenally." "We had to care about the guests, yaar," he says simply. Asked about his first call home, Oberoi -- again calmness personified -- says, "They knew what had happened. I told them to stay at home quietly. Whenever we can get out, we will get out." In the first six hours of the siege Oberoi received some 250 messages and calls from family members and friends, all inquiring about his safety, till the time his phone went dead. His sons, one in London and another in New York, were worried for him. Oberoi could speak to his wife Mallika till 1 am; after that for some 4, 5 hours he was out of reach. Some television channels even flashed the 'news' that he had been killed. Talking about the four terrorists who stormed the Taj, he says, "We never came into contact with them, they didn't talk to us. My colleagues died right here. I was in the nearby corner. For 11 hours we were in this area, serving whatever we could to our guests. That's how life is." It's difficult to determine if Oberoi is stoic, someone who is hard, impassive, and unaffected in pain and pleasure, or a soft but dedicated professional. Maybe he is all that and more. What hurts him even now is that he could not save his people. "I wish I could have saved my young chefs. They had not seen life, they were too young to die. Except Vijay Banja, all my chefs were under 24, 25. Vijay, my executive chef, was nearing 50. I miss them. My young chef Hemant struggled for seven days before he died. Another chef, Faisal, was moving an injured chef, but suddenly realised that one of the terrorists was on the staircase above. The terrorist shot dead both Faisal and the injured chef. Faisal was just 21 years old. Zaheen was shot in the kitchen, still he managed to walk down and reach a hospital. Boris Rego was also shot and we could not save him. He died instantly, like Sadanand. I was in this area till 3.45 am." Even though the chefs's bullet-riddled bodies lay there, their colleagues in the kitchen kept serving the guests. "We didn't know what happened to the people who got injured. I was getting information all the time saying 'this fellow has been shot, that fellow has been shot.' We were trying to save the lives of other guests," says Oberoi. After spending some seven, eight hours in the kitchen Oberoi and 16 others moved into another part of the Taj and locked themselves up in a small room from 4 am to 8 am. Once they felt a little safe they contacted the National Security Guard via sms and were rescued. 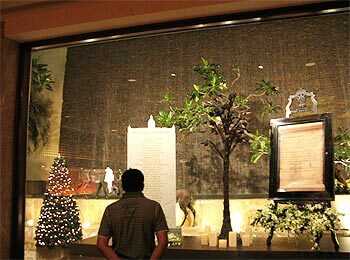 The Taj has created a corpus for the staffers and guests who were killed during the attacks. "Touch wood we are in touch with all their families," says Oberoi. "Whether I get time or not my colleagues and others are in touch with them. Ratan Tata (the chairman, Taj hotels) has been so kind. The last drawn salary will be paid to the victim's family for life. We recently celebrated the 20th anniversary of our restaurant Zodiac Grill where we served Kahlua mousse in memory of my chef Zaheen Matien. His father has written a note saying 'Thank you very much for putting up that dessert.'" But the employees's healing process took time and effort. "The counsellors took each department separately. We divided our people in batches of 10, around 35 batches in all. We told our pals, we will get back. For the sake of our colleagues who lost their lives we shall get back to normal. We will prove to the world that we can't be bogged down. Some were shaken a bit. Some were angry. Some were having anxiety attacks. Many of us were angry to see the government's failure, the police and security force's failure in not arriving in time. I was angry, too. Our police force was not even equipped to take on terrorists." The Taj Hotels's Web site doesn't highlight 26/11, possibly in an effort to forget and look ahead. But there are enough reminders of it in the hotel, right from the entrance where the security drill serves as a stark reminder. Although the security is not intimidating, because of the extra-courteous staff, it nevertheless brings a lump to one's throat. As one enters the hotel lobby its famed spirit of defiance is there for all to see. Oberoi has imbibed Mumbai in that sense. When we asked him how he managed to serve sandwiches when gunshots were ricocheting all around, he said, "I think at that moment nothing else comes to your mind except calm." "I think it comes from within." "The first thing on our mind was just save, save. Save everybody. They are our guests, first try to save them. Around 200 people were in the Crystal Room, 150-plus people were in Wasabi, the Golden Dragon and Masala Craft. The guests were coming in from all sides were we were taking them to safe places. Till about 3'O clock we were here, then they (the NSG commandos) barged in." Oberoi believes the media didn't do justice to their ordeal. "The media should have stayed away from live coverage. We could have saved more lives. They (the terrorists) got direction from the TV coverage." "I don't remember, or don't want to remember, bad things. However, I do think of my colleagues who are no more with me. After a year I still remember how they saved hundreds of people, how we managed to evacuate them, some of them were herded to safety even as the terrorists were shooting recklessly." "Literally, we were pushing out the people to safer areas. I think my colleagues did a tremendous job, some of them lost their lives in the bargain." "See, when I was walking down the kitchen corridor I didn't even realise that I could have missed a bullet. That night I was moving here and there, and from where the bullet would have come was just a matter of destiny." He says with a sense of pride, "We lost 31 people of whom 18 were Taj staffers. Only 13 guests were killed in the entire carnage. We saved as many lives as possible. These 18 died because they rushed to save other people's lives." "I could hear everything, bullets, shots, everything," Oberoi adds. "We blocked all the passages. My young chefs were so good that they carried bottles and drinks even outside for guests who had been evacuated. One of my chefs was shot at in the Chambers. He was injured, but survived because the dead bodies of guests lay on him." "I am trying to forget all that," he says. "I want life to move on." "On November 29 the Taj siege was over, and the same evening I was back in my kitchen. I came to office. My laptop was here. Only two of us -- my chef Sadiq and I -- came. This cabin was open, our security guards were around," Oberoi says, explaining the urgency he attached to continue working even when challenged by events like 26/11. He cried for the first time after 3, 4 days, at his colleagues's funerals. "I have fantastic memories of all of them. Chef Banja would stay back every night to let me complete my work. We used to go home together. For some seven years he has dropped me home. All the young guys who died had a great career ahead of them." "I miss them. In fact, two three times I have said out loud 'Here Kaizad, do this,' before realising that Kaizad is no more, and say 'Sorry Kaizad'." "The kind of support (Taj Vice-Chairman) R K Krishnakumar and Ratan Tata and our general manager Karambir Singh Kang gave all of us was tremendous. For a month they didn't do anything else, they were with us." "Kang had lost his family, still I met him in the lobby at 3 am that same night. I think the tremendous spirit of the people of Taj and the great support of Krishnakumar and Tata that have made healing easier. Everybody looked towards us, and we look at them. That's how things are working here." 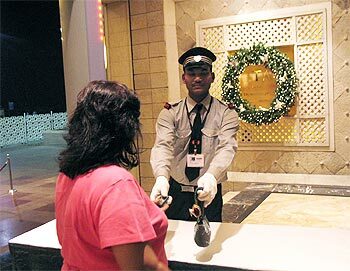 Image: The security routine is the only reminder at the Taj Mahal hotel of 26/11. Within a week of the terror attacks Oberoi got his entire kitchen cleaned up. His team returned to work. Everyone worked 17 hours a day to put the hotel back on its feet. Oberoi, who has been with the Taj for 35 years, says, "It was not easy at all. We had to start from scratch. We threw away every single thing that was exposed. We threw away all the pans, cutlery, glassware and everything else. The people's response was fantastic. Our suppliers were all ready to help. The next day a thousand people were in the lobby to share." "I am pushing hard to open the Golden Dragon and Wasabi before November 26. We are working 24/7. We have brought in a new menu and new concept. More than 45 new dishes have been prepared. Schezwan and Shanghai dishes are on the menu." "We had employed Dong, a Chinese chef, just three weeks before 26/11. He saw our spirit, and is so moved that he has stayed back. Any other expat would have run away. My other Chinese chef, Ming, has been with me for 14 years. He has also stayed on. I have a team of 18 chefs with me for the last 15 years. We have team spirit. We didn't sack anybody and in the last one year hardly anyone has left us." The Golden Dragon at the Taj was the first Schezwan restaurant in India, and remained number one for 30-odd years. Now Oberoi is directing all his energy to put it back on top, and wipe out the memories of 26/11. Mumbai-ites. he says, are waiting to respond to his enthusiasm. "Booking is not open, but we have already got an advance booking of 100 guests for the first day. We made all efforts to get the Taj back to normal. Within a month we were travelling." "My son Siddhartha's wedding was held here in March 2009, and I had 500 people here. Ratan Tata and Kumar Mangalam Birla (chairman, Aditya Birla group) attended it. I thought, let me lead the way. If I can host my son's wedding here, why can't others? Since then things are normal and many weddings and parties have taken place. We are back to normal." "Last year on December 21 I decided that I must get Wasabi (the Taj's Japanese restaurant) ready as soon as possible. On the 25th evening we opened a temporary Wasabi. We have inner strength. Life doesn't stop." "After 26/11 I think more and more that somewhere down the line good deeds pay. Keep on doing good deeds. Save others' lives, and your own will be saved by somebody." Asked if he was depressed after 26/11, Oberoi says simply, "Must have happened, I think. I am human." "When I think of my chefs, when I miss them, I feel sad. Then I think of opening new restaurants. I think up new menus. New design and new concepts. I think my wife has been a good support. She also passed through an equal amount of trauma." Asked how he will remember the terror attacks when he gets old, Oberoi replies with a mischievous gleam in his eyes, "When am I going to get old!" True Mumbaikars don't let even age get the better of them. 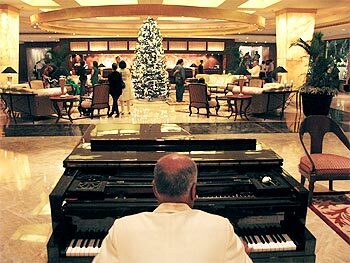 Image: The lobby at the Taj Mahal hotel.